De Koekenbakkers (= The Cookie Bakers in Dutch) is a small family business headed by Mariëlle de Vroome and her husband Clemens Fortuin and is located in Groningen, The Netherlands. 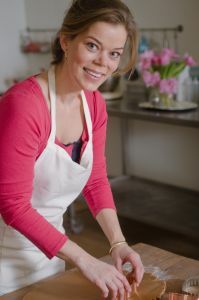 Mariëlle is the creative mind who started her cookie adventure in 2010 and since then she has been a full time cookie decorator, cookie cutter designer and instructor of cookie decorating classes across Europe and the rest of the world. Her work was featured in a variety of national and international magazines and her cookie business has made bespoke cookies for clients like SONY, ECCO, L’Oreal, Jimmy Choo, Armani, Mont Blanc and Twitter. In 2012 Marielle's first book about cookie decorating (‘‘Het Koekboek’’) was released in the Netherlands. Be sure to follow her cookie adventures on Instagram & Facebook!